Cat allergies stem from a tiny protein, not cat hair. Cat allergies can be mild, or they can make your life miserable. Symptoms can manifest in various different ways, making you sneeze, wheeze or scratch like a person possessed. But don't blame the cat for your reaction, blame your overactive immune system. Contrary to popular belief, replacing your fluffy tabby with a hairless cat will not guarantee you will not experience the hives, sneezing fits and itchy eyes that make allergies so much fun to deal with. That's because it's not actually the hair you're allergic to, it's the dried saliva or dead skin on it. There are tiny protein strands in a cat's saliva, skin dander and urine that throw your immune system into overdrive, producing the symptoms associated with an allergy. Your body has essentially classified these otherwise harmless proteins as major threats, and kicks your body's defense mechanisms into high gear to eliminate them. When your body senses this harmless cat protein and goes into danger mode, you experience a variety of side effects of the War on Dander in the form of your allergy symptoms. Some are respiratory, such as wheezing, coughing and sneezing, while others appear on your skin as hives, redness and itching. These symptoms could appear almost as soon as you have contact with a cat, or only hours afterward. In many cases allergy symptoms are little more than an annoyance, making you miserable for as long as you're around a cat but typically going away with time, a good shower and some allergy medication. But in some cases the allergy goes beyond inconvenient and becomes downright dangerous. Allergy symptoms can trigger an asthma attack, or become so severe you may have trouble breathing. Keep track of your symptoms after exposure to a cat, and see your doctor if they worsen. 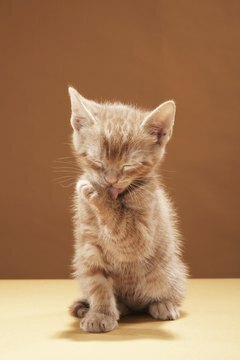 Since the allergen responsible for your suffering is found in a cat's saliva, skin and urine, shaving your kitty will not stop your symptoms. The most effective treatment for allergies is preventative, meaning you should avoid being around cats as much as possible, or take allergy medication before having contact with one. Desensitization shots introduce an allergen into your body a little at a time to remove your sensitivity to it, thereby reducing or eliminating the symptoms of a reaction. Regular brushing and bathing of your cat and strict vacuuming to remove all shed hair will help reduce the amount of allergen hanging around, helping you to enjoy your kitty more, allergies and all. Purebred Cat Breed Rescue: Allergic to Cats? Does Dairy Make Cats Itch? What Time of Year Do Cats Shed?